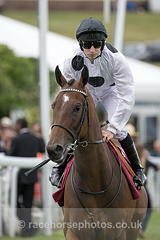 Marsha defied a 7lb penalty for her Prix de l'Abbaye triumph with a scintillating display on her seasonal debut. The Sir Mark Prescott-trained filly showed a superb turn of foot in the final furlong to get the best possible start to her 2017 campaign with a clear-cut victory in this Group Three test over five furlongs. Luke Morris brought the 8-1 shot near the stands rail to power into the lead and held the challenge of Irish raider Washington DC by a neck. Goldream, the winner of this race in 2015, was a length away in third place. Morris said: "I thought it would be very tough for her off a 7lb penalty and when Sir Mark told me the last filly to do that was Lochsong, I knew she would have to be very good. "Fair play to the team at home. They got her spot on for today. "She has really filled out and when I pushed the button on her, I got there too soon to be honest, she got a bit tired up the hill. "I thought she was very good. When I pressed the button she was electric and, fingers crossed, there will be more big prizes for her this year. "All her best form is over five, so races like the King's Stand and the Abbaye will be right up her street."